I have always maintained that I do not have a 'favourite' singer - male or female. I love songs, and which song I want to listen to, or which singer I like, depends on the moment and the mood I am in. In my post on Kishore Kumar, I responded to a comment about 'favourite singer' by saying "...when I hear Beqarar karke humein, Hemant Kumar is my favourite singer; when I hear Jinhe naaz Hind par, I love Mohammed Rafi; when I listen to Chalo ek baar phir se, I'm sure Mahendra Kapoor is my favourite singer. Yet there are so many many songs of Kishore's that I listen to, over and over and over again." That is equally true for female singers. But if I were forced to name a favourite singer, it would be, without any hesitation, Mohammed Rafi. Perhaps it is because I grew up listening to him. Perhaps it is because, as far as I am concerned at least, he sang more wonderful songs than all the others combined. Perhaps it is because the more I heard him, the more I fell in love with the sheer range in his voice. I do not know. I do know that it is difficult, sometimes, to explain just why you like somebody or something. You like them, and that is that. Mohammed Rafi, to me, falls into that category. And so, it is strange even to me that, in three years since I began writing, I have not published a post on Mohammed Rafi (other than a post of my favourite Rafi songs when I first began blogging). Of course, I did write about Rafi singing for Shammi Kapoor, though that leaned heavily towards the actor than the singer. Later posts - another one on Shammi, on Johnny Walker, on Joy Mukherjee, even Dev Anand, not to mention my themed lists - had a surfeit of Rafi. But I had never written one that was devoted solely to him. Here, on his 34th death anniversary, I aim to remedy that lapse. 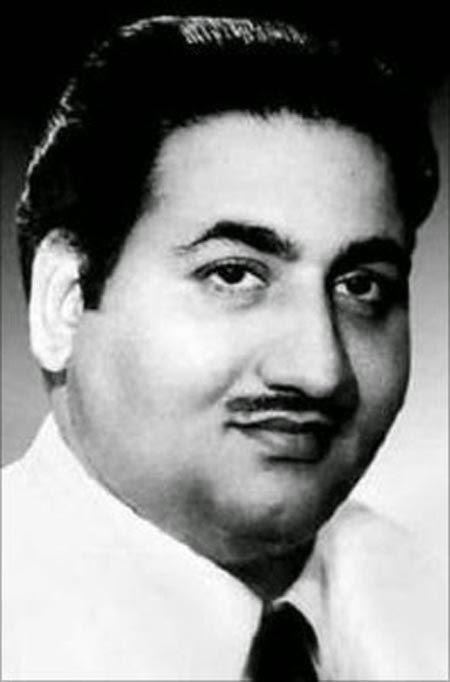 Mohammed Rafi was born in Kotla in Punjab. As a young lad, Rafi was fascinated by the voice of a wandering fakir, and began to imitate his songs. (You can listen to an interview where he talks about his early days here. Soon, his father moved to Lahore, where young Rafi began his classical training under Ustad Bade Ghulam Ali Khan and Ustad Abdul Wahid Khan. He also trained under Feroze Nizami and Pandit Jeevanlal Matto Kashmiri. Call it Fate or Destiny. Mohammed Rafi's first public performance was at concert in Lahore where KL Saigal was scheduled to perform. Due to a power outage, the microphone was useless and the legendary singer refused to sing until the power came back on. The crowd was growing restless and the organisers were in a fix. Abdul Hameed, a friend (and soon-to-be-brother-in-law) convinced the organisers to let Mohammed Rafi sing until Saigal could take over. Thirteen-year-old Rafi thus performed for the first time in public. KL Saigal, impressed by the young lad, blessed him with success. Music director Shyam Sunder was a member of the audience, and was also quite taken by the young lad's voice. He offered Rafi a chance to sing for him, and in 1941, Mohammed Rafi recorded his first song - Soniye (Goriye?) nee heeriye nee for the Punjabi film Gul Baloch. (The film only released in 1944.) By this time, Rafi was beginning to make a name for himself, and by 1943, had become a regular on Radio Lahore. It was only a matter of time before Hameed was persuading Mohammed Rafi's father to let Rafi move to Bombay, under his guardianship. Eventually, the two did come to Bombay. The days of singer-actors was still the norm, and a singer who only wanted to sing was unusual. Life was not a cakewalk for the young singer. Days of struggle followed, though everyone who heard the young man sing were enthralled by his voice and predicted great success in the days to come. It was Tanvir Naqvi, poet and lyricist, who introduced Rafi to film producers and directors such as Mehboob Khan, Abdul Rasheed Kardar and (actor) Nazeer. Kardar, who was making a film called Pehle Aap (1944), signed Naushad to compose the songs; and Rafi sang his first song for the composer - Hindustan ke hum hain. (He was accompanied by Allaudin, Shyam Kumar and chorus) It was the beginning of a long collaboration between the composer and singer. There is some dispute over Mohammed Rafi's first song in Hindi. While Dil ho kaboo mein from Gaon ki Gori under Shyam Sunder's baton is considered to be his first song in Hindi (and was corroborated by Mohammed Rafi in that link to the interview that I gave earlier), in an interview with Star & Style, Rafi stated that he had sung a qawali along with SD Batish for Pandit Govind Ram in the Nazir-Swarnalata blockbuster, Laila Majnu. However, Pehle Aap's songs were released before Gaon ki Gori's score, and Laila Majnu released only a year later. Slowly, the young lad began to make a slow but steady foray into the world of film music. In 1946, one of Mohammed Rafi's dreams would come true - he would sing in a chorus for Shah Jehan, where the lead singer was KL Saigal. It was a memory he cherished. The next year would see him sing a duet with another legend - singer-actress Noor Jehan. The film was Jugnu, and the song Yahan badla wafa ka. Though he had earlier sung Tera khilona toota balak in the Noor Jehan starrer Anmol Ghadi, this was the first time he would be singing with the songstress. Reports suggest that it was Noor Jehan who recommended Mohammed Rafi for the song. (You can also see Rafi in a cameo in this song, a duet with Asghar Sarhadi.) Yahan badla would catapult Mohammed Rafi to the top, as much as it provided a great fillip to the career of its hero, Dilip Kumar. It was only the beginning. It was as hard a task to mine through his entire career and come up with a handful of songs, as it was to do so for Lata, Mukesh, Kishore, Manna Dey, etc. I also tried not to repeat songs that I have already posted in other lists, but sometimes, an overlap is inevitable. But then, I could make a hundred disparate lists of Mohammed Rafi songs that I love and there will still be more to explore. Here are a few of his solo songs that I absolutely love - different music directors, different genres, all beautiful songs that one can listen to again and again, marvelling all the while at the sheer versatility of a man who was not only a great singer but was also the epitome of humility. In the film based on the life of the legendary 19th century poet, Mirza Asadulla Baig Khan, better known as Ghalib, this was the only Mohammed Rafi song other than a duet with Banda Hassan (Sakhi sarkar hain tere), and it was not picturised on 'Ghalib' (Bharat Bhushan). Ghalib's voice in the film was Talat Mahmood while Suraiya sang for Chaudvin (Suraiya herself), Ghalib's ill-fated lover. Directed by Sohrab Modi, the story was written by Sadat Hasan Manto, while Rajinder Singh Bedi worked out the screenplay. More than the fictionalised biography of Ghalib (there is no evidence to suppose that Moti Begum, a.k.a Chaudvin, the courtesan, ever existed), it was the use of Ghalib's nazms and ghazals that were set to music by Ghulam Mohammed that raised the movie to one that was not merely a biopic. Ghulam Mohammed's versions of Nuktacheen hain gham-e-dil, Dil-e-nadaan tujhe hua kya hain, Aah ko chahiye ek umr asar hone tak, etc., are still considered classics. Bhajans are not usually my cup of tea, but there is something very attractive about Mohammed Rafi singing bhajans - the devotion is unmistakeable, the faith is unwavering, and it is hard, as a listener, to not feel it. (I feel the same way when I hear Yesudas sing Guruvayoor ambala nadayil for that matter. As my grandmother said when she learnt that the Guruvayoor temple authorities had forbidden him entry, "All Yesudas has to do is to sing it wherever he is, and Guruvayoorapan will present himself in front of him.") That is precisely how I feel when I hear Mohammed Rafi sing a devotional song. Devout Muslim that he was, he seemed to transfer that faith to whichever God he was singing to - bearing out the tenet that there is just one God. Basant Bahar, adapted from Ta-Ra-Su's (TR Subba Rao) Kannada novel Hamsa Geethe, had a plethora of melodious songs, including Manna Dey's Sur na saje and Ketaki gulab ki, and the Lata-Manna Dey duet, Nain mile chain kahan. Rafi's two solos, Badi der bhayee and Duniya na bhaaye mohe are no less soul-stirring. He instils both with the right blend of fervour and pathos. I do not remember much of the other songs in the film (I do remember a very young Helen dancing, though), but this one stands out for the music and the way Mohammed Rafi sings it. (It helps to see a very young and dashing Premnath onscreen too.) It starts off on the lower octave, and then soars to heights that seems incredible for a male vocalist, and then drops an octave and a half, with flawless control. If this is a post about Mohammed Rafi, can I leave Shammi Kapoor out of it? Rafi has indeed sung for many heroes before and after Shammi Kapoor, but the relationship between Shammi and Rafi transcended the usual affinity between actor and singer. Shammi, definitely, thought of Rafi as his voice, his soul. And he claimed that Rafi always put in 'a little extra' for him. It is true that the best songs of Shammi Kapoor have been sung by Mohammed Rafi. And when I did a post on Shammi Kapoor's songs sung by Mohammed Rafi, it was hard to decide what to leave out. In fact, Hum aur tum aur ye sama has seen light on several of my lists. But it is one of my all-time favourites, and to me at least, exemplifies all that is best about the actor-singer collaboration. A handsome Shammi, a doe-eyed Asha Parekh, the swirling mists, Mohammed Rafi's voice sounding like liquid gold, and intoxicating as hell... this was romance, distilled to its purest essence. This song was incredibly sensuous, but there was a tinge of innocence that offsets it. Usha Khanna's music (her debut), barely there until it swells into a triumphant crescendo at the end, just complemented the picturisation. Madhumati won for Salilda the Filmfare award for Best Music Director. This was the year that Filmfare also constituted the Best Playback Singer award, and it was awarded to Lata Mangeshkar (there was only category that included both male and female singers) for Aaja re pardesi. Bimal Roy had veered from his usual scripts to film Ritwik Ghatak's whimsical tale of a vengeful ghost, reincarnation, and a love that transcended death. Bimalda made full use of shadows and light to heighten the suspense, and Shailendra wrote lyrics to match the mood. The tour de force, however was Salil Choudhary's music that made full use of the folk rhythms of the North East. Toote hue khwabon ne is one of the songs that make you wish that Salilda had utilised Mohammed Rafi's voice more than he did. But while he had Mukesh sing all the other songs in the film (except for O bichua which was vocalised by Manna Dey), he had to bring in Rafi to sing this and Jungal mein more nache. Just listen to both songs, and witness the voice modulation that differentiates between the two actors. The pathos that Rafi brings to this song is indeed heartwrenching. The last Mughal Emperor of India is supposed to have written these lines while living his last days, ailing, in exile in Rangoon. There is a dispute whether the Bahadur Shah Zafar ever wrote this ghazal (or even Na kisi ki aankh ka noor hoon) but the film, and popular imagination, credits the exiled and dying emperor with the writing this as his own epitaph. He was after all known to be an Urdu poet of no mean talent, and reportedly, wrote his verses on the walls of his prison with the burnt end of a stick when he was denied writing materials by the British, who were wary of his attracting an army to him through his poetry. Rafi's voice, reciting this ghazal, with barely any music to accompany him, carried every ounce of the pathos felt by the unfortunate emperor - a man imprisoned far away, lamenting his misfortune, not at losing the crown, but at the knowledge that he would not, after his demise, be buried in his homeland. Considered one of Rafi's best numbers, this extremely complicated song is also widely regarded as the best of Khayyam's compositions. A very young Dharmendra (this was only his second film) sings his frustrations out on screen - Rafi's voice expresses that emotion off screen. This is not a man who is merely expressing his heartbreak over a lost love; it is a person who has deliberately set out to obliterate any memories of a childhood love. In a test between friendship and love, one has to be sacrificed for the other. He chooses to sacrifice his love. Kaifi Azmi's lyrics perfectly describe the emotions behind that decision. This is what set our legendary singers apart from their imitators - the ability to emote, in song, that which the actors expressed on screen. Rafi's greatest virtue, apart from his unmistakeable vocal talent, was his ability to modulate his fabulous voice to suit the actor he was singing for. He sounded different while singing for Johnny Walker, for instance, or for Shammi Kapoor. His songs for Dev Anand sounded different from his singing voice for Rajendra Kumar. As I said before, Naushad could rightly claim to be the person who 'introduced' Mohammed Rafi to the Bombay film industry. After all, it was his composition in Pehle Aap that was Rafi's first released song after he left Lahore. Why did I choose this song over Naushad's raga-based compositions for Mohammed Rafi? Simply because I wanted something different. The first composition that comes to mind when I think if Naushad-Rafi is O duniya ke rakhwale, and I already had a bhajan. Besides, this song is great fun. A brothers-on-the-opposite-side-of-the-law story set against a rural background, the film veered away from Hindi to use a dialect. Bhojpuri. (It is closer to Avadhi; see AK's comment below.) While South Indian Vyjayanthimala impressed with her faultless enunciation, lyricist Shakeel Badayuni also used Bhojpuri the dialect for the lyrics, instead of Hindi, to insert a sense of versimilitude into the proceedings. Mohammed Rafi, as usual, sang this song with the same elan with which he sang songs written in Hindi and Urdu. This was one of Naushad's best scores in later years. This song, as much as any other that Mohammed Rafi sang for Dev Anand, typified the person Dev Anand was - full of life and the joy of living. Rafi's voice, swelling and ebbing through the serpentine roads on a misty night, is filled with the ecstasy of love, and brimming with the eagerness to find one's beloved behind the closed doors and shuttered windows. And when he finally sees her, smiling gloriously at him, it is as if the moon has just stepped out from behind the clouds, dispelling the darkness around. Just hear the complete and joyous surrender in both Dev's face and Rafi's voice as the song comes to a close. SD Burman had a long association with Mohammed Rafi, composing some of the latter's career-best songs. Based on Munshi Premchand's famous novel of the same name, Godaan was the story of a farmer and his family, set against a background of class and caste discrimination and injustice. Mehmood plays the younger brother, with greyish undertones, very dissimilar to his usual comic side roles. Like Ganga Jumna before this, Godaan also used the Bhojpuri a regional dialect to great effect. Anjaan's lyrics evoked the rustic simplicity of a villager, and Pandit Ravi Shankar used folk music very effectively in this lovely composition. The rollicking folk tune is the kind that puts a smile on your lips and a lilt in your step as you go about your day. And as always, Mohammed Rafi sings it with a vim and a verve. You can sense the joy that Mehmood's character feels as he goes back home to visit his beloved. The composers, once music arrangers for SD Burman, and later assistants to Kalyanji-Anandji got their big break with Babubhai Mistry's fantasy Parasmani. (Their first film Hum Tum aur Woh as independent composers was not released.) Parasmani was one of those films that had better songs than it deserved. Each one of the songs that the young music directors meticulously composed was a gem. They had the backing of some of the greatest vocal talents in the industry as well - Lata Mangeshkar (Hansta hua noorani chehra with Kamal Barot and Ooi ma ooi ma), Mukesh (Chori chori jo tumse mile), and Mohammed Rafi (Roshan tumhi se duniya and Woh jab yaad aaye). It was the beginning of a long association with Mohammed Rafi and Lata Mangeshkar. Roshan tumhi se duniya had Rafi exercise his considerable vocal skills as he plays effortlessly with the notes. He makes the song sound exceedingly simple. The songs of Parasmani, however, were not the legendary singer's first songs with the composer duo. Mohammed Rafi's first recorded song for LP was Tere pyar ne mujhe gham diya from Chhaila Babu. It was recorded in 1961. However, the film only released in 1967. Kidar Sharma had already adapted the novel of the same name by Bhagwati Charan Verma, into a film starring Mehtab, Nandrekar, and AS Gyani. He decided to make it again 23 years later. Chitralekha, brought to a realisation of Princess Yashodhara's love for Bijgupt, commander-in-chief of the Mauryan army, decides to forsake her love for the sake of king and kingdom. However, Bijgupt is bereft, and feeling the pangs of lost love. He seeks refuge in an outpouring of grief that questions not just how love seems to end in heartbreak, but the futility of life itself. Roshan's music, and Sahir's lyrics combined to give us one of Hindi film music's clasic melodies. Mohammed Rafi's mellifluous voice melds mood and music together to bring to life one of Hindi cinema's finest odes on love and loss. I hold Mohammed Rafi personally responsible for a great many 'heroes' becoming successful. Of the likes of Biswajeet, Bharat Bhushan, and their ilk, Joy Mukherjee was the one person who could reasonably lay a claim to Shammi Kapoor's legacy. It was interesting to see how Mohammed Rafi modulated his voice in this song. The song has all of Rafi's adaas even though it is one of the quintessential romantic numbers that he had sung a hundred times before. I love the way his voice rolls over the syllables, almost as if he is drunk - on love, not liquor. Sublime. There was a time when every second Gulshan Nanda novel was made into a film. Kaajal was no different - adapted from Nanda's Madhavi, the script was edited and polished by Phani Majumdar while Kedar Sharma added the scintillating dialogues. But like many films of that period, it is the music that lifted the film above story and script. Sahir's lyrics, set to music by Ravi, still make for engrossing listening. For a teetotaller, Mohammed Rafi has sung a number of 'drunken' songs, slurring his voice quite effectively. This is one such, though the context is slightly different - here, the character on screen (Raj Kumar, playing Meena Kumari's profligate husband) is trying to coax his wife into having a drink. It is Rafi's voice that adds the touch of reality to Raj Kumar's stylised depiction of a drunkard. Based on Tess of the D'Ubervilles, and credited for the same, the film did not have much to recommend it, even with its stellar cast of Nutan, Dharmendra and Rehman. (Even though we got to see some fantastic acting from all three leads as well.) However, it did have some wonderful songs, courtesy a certain Madan Mohan Kohli, ably complemented by his long-time lyricist Raja Mehdi Ali Khan. As was the case with most films that Madan Mohan composed for, Dulhan Ek Raat Ki found few takers at the box-office. Perhaps the fact that it was a Black & White film in an era where colour had begun to be the default proved to be its nemesis. Or perhaps people just didn't want to see such a tragic film. Its music, however, continues to delight us. Mohammed Rafi's voice caresses the notes, reminding us of the whiff of long-gone romance that continues to faintly linger on in our memories. This was the quintessential love ballad, and a very good-looking Dharmendra evokes goosebumps, especially since Mohammed Rafi's vocals almost caresses each note. OP Nayyar had a long and mutually rewarding association with Mohammed Rafi, and this song, one of the best that has come out of that partnership, is pure romance. There is no doubt at all. He is laying his heart at her feet, she is more than willing to accept it. There is a quiet promise in his avowal of love, and above all, there is devotion - in the lyrics, in Rafi's voice, in the way Dharmendra and Tanuja look at each other... how can it be his fault that his heart skips a beat when she is close by? This is one of the songs that remind me why, when pushed to make a choice, I always pick Rafi as my favourite male singer of all time. Mohammed Rafi has sung many songs for Shammi Kapoor. He has sung many exuberant songs for Shammi Kapoor, so it should come as no surprise that he should do so yet again. Deewana mujhsa nahin is quietly exuberant (even if that is an oxymoron). Even though it is one of Shammi's 'stalker songs', it is less egregious than most others. RD Burman very nearly did not compose for Teesri Manzil. He had been signed on, in place of his father who was unwell at the time, when Dev Anand toplined the cast. Unfortunately for RD, Dev Anand was then busy with his home production, Guide, and decided that he couldn't take on more work. Shammi Kapoor stepped in. It was well-known by then that Shammi's composers of choice were Shankar-Jaikishen or OP Nayyar. But Jaikishen persuaded Shammi Kapoor to give RD Burman a chance. In a later interview, RD, would mention how nervous he was at the audition. When he nervously sung the first two lines of a Nepali folk song, "Shammi completed the song for me, and said 'Aage chalo. Ye gaana main Jaikishen ko denewala hoon.' " That completely destroyed the young composer's equilibrium. But soon he won over the charismatic star, and RD was on board. With Shammi in the film, there could also be no dispute over who the male playback would be - and so Mohammed Rafi got to sing every song, solo and duet, his smooth vocal calisthenics making every song seem simple - from the rambunctious Aaja aaja main hoon pyar tera to the lively O haseena zulfonwali to the softly romantic Tumne mujhe dekha. While RD switched allegiance to Kishore Kumar quite early on, and by Yaadon ki Baraat was beginning to favour using Kishore almost exclusively, I came across this rarely heard solo Mohammed Rafi version of Chura liya. I do not know where the song was used; whether it was a cover version for their duet, or if not, why it was recorded, because the male solo is not part of the film itself. These are but a few of my favourites from among Mohammed Rafi's vast repertoire of solo songs. As you may imagine, it is a hard task to keep to a limited number of songs. And as always in this category, I need to keep the duets for another post since it is well nigh impossible to do justice to both solos and duets in just a single post. Hence, part II will have a selection of some of my favourite Rafi duets. Tell me, what are your favourite Mohammed Rafi solos? Mohhamed Rafi has been THE favorite singer, even as I have liking for all other singers. Wah. What a great write up. I agree with you, you can do the rounds of all the singers, and come back to Rafi. He understood playback singing like no one else. Ashokji, I had completely forgotten Jaag dil-e-deewana; what a lovely song that is! Thank you for reminding me of it. Main apne aap se ghabra gaya hoon is a song that I must confess to not having heard before. Chun chun karke aayi chidiyan is of course very well-known. do the rounds of all the singers, and come back to Rafi. So true. And that is how I know he is my favourite singer. :) Because I always end up with Rafi. As usual it is a good post and well written. As usual I am hesitant; you may know why. I know your knowledge is huge;but you may verify these. This was the only Mohammed Rafi song; probably there is another(" Sajde main hai sar"). It was also Naushad who gave him his first big hit in Yahan badla wafa ka (Jugnu). I don't think so. Mohammed Rafi's first recorded song for LP was Tere pyar ne mujhe gham diya from Chhalia.Not chaalia , but Chailaa Babu. Good write-up and you wrote well. My comments disappeared. I don't want to repeat whatever I wrote. If you have access to that you may modify your text as per the need. Shyam, for some reason, DIsqus decided to put you into its Spam folder. Luckily, I get email notifications, and could pull your comment out from there. Both your comments have been posted, as you can see. I have also 'approved' you on Disqus, so there shouldn't be a problem any more with your comments disappearing. I'm never sure how Disqus decides a comment is Spam. Sorry about that. Your comments are valuable for me, since you allow me to correct the mistakes I make while posting. Shyam, I went through all the listed songs of Mirza Ghalib once again, and this is what I found: you are right, there is one more Rafi song in the film - a duet with Banda Hassan called Sakhi sarkar hai tere. That must be the song you mean? But, but, but, Rafi had hapy songs too! :) And rapturous ones (just listen to his songs for Shammi Kapoor or Johnny Walker...) So many Rafi songs left, Miranda; happy explorations! Thanks for your detailed, prompt response and also for approving me on Disqus. I gave the you tube link. The point is not weather it was his first hit or not,but it is about the music director( It was Firoz Nizami Sab, not Naushad Ali Sab). Please accept my spelling mistake. Shyam, once again, thanks for your eagle eyes. Have removed that sentence attributing the score to Naushad. As for the video, it is the same as the one I posted below - only there it is listed as Sakhi sarkar hai tere. I also found it listed under Deewane yahan tak pahunche. With so many titles for the same song, it is no wonder, both sites I checked didn't have the song listed! You are brave, Anu! I would never dare to take up something as vast as Rafi's repertoire for a single post. I would restrict it by limiting it to songs of different moods, filmed on different actors or set to music by different composers. As you have yourself said, one could make a hundred lists of Rafi songs. That said, I must say you have done an excellent job. All the songs are familiar, but your write-up on each makes it a pleasure to revisit them. I couldn't identify the first song from the title but it all came back as soon as I heard it. I must have heard this song after decades! Thanks. The songs of your list can easily extend the above selection with one possible exception: I think 'Toote hue khwabon ne' would sound better in Mukesh's voice. Perhaps 'foolhardy' is a better word? :) But I felt the same way when I was writing posts on Lata, Kishore, Manna Dey, Mukesh, Shamshad, Suraiya... where does one even begin? So many, many posts waiting to be written on the treasure trove of songs from that period, no? I have already written up a post on Rafi's songs for Shammi; my Johnny Walker post obviously had only Rafi songs; Joy Mukherjee was mostly Rafi; quite a few of my Dev Anand posts had a plethora of Rafi songs... and yet, there are so many songs left to write about, to listen to, again, to explore. What joy! Ditto Subodh, it is impossible to make a list of Rafi's best ten. But he has still gone ahead and made a list of 'quintessential' Rafi songs. I won't do that either; I would have to break it MD-wise. I have already done my favourite Rafi songs by Naushad, Roshan and SD Burman. I have also done Rafi's duets by SDB, and earlier best of Rafi-Lata duets, taking not more than one by a composer. For someone who does not have a 'favourite' singer, you have written a marvellous post with a great deal of research. Let me make a few observations. A young Rafi managing a restless audience by singing Saigal's songs when lights went out: A very knowledgeable person, who is kind of an insider, tells me most of such stories, which are now a part of folklore, are apocryphal. Nevertheless, I myself repeat these stories on my blog, because everyone says so, and these have a nice ring to them. Ganga Jamuna, Godaan having Bhojpuri dialects and songs. Now this one is not apocryphal - it is plainly wrong. Since I come from the heart of Bhojpuri land, you can take my word for it. For Bhojpuri films or dialect, you have to go to Bhojpuri films - the classics like Ganga Maiya Tohe Piyari Chadhaibo, Bidesiya, Laagi Naahi Chhute Ram of the 60s, or current films you can watch on Mahua or Hamaar channels (I don't know if you can get them there). The 60s films I have mentioned became famous all over the country because of the superb music by Chitragupta. However, the songs which were sung by Lata Mangeshkar, Talat Mahmood, Rafi etc. were more mainstream, and closer to Bambaiya Bhojpuri, or Ganga Jamuna Bhojpuri, if you will. Avijit Ghosh (of Times of India) has written a very good book "Cinema Bhojpuri". If you happen to get in touch with Bhojpuri actors, Ravi Kishen and Manoj Tiwari, or mainstream actor, Manoj Bajpayi, who is not only from Bhojpuri belt, but has kept in touch with his roots, you would know what I am saying. Thanks a lot for writing about Rafi. It was so painful to notice that yesterday there was no mention of this great singer on any Radio or TV channel except vividh bharti. There are full day's programme on pancham,kishore,asha,lata.....but Rafi the greatest of them ignored totally. So thanks a lot. Rajesh Khanna and Rafi - Jamaane ne maare jawaan kaise kaise..
About the Bhojpuri dialect being used - yes, coming from the heartland, you would definitely know better. But, what would you call the dialect then? You yourself call it 'Bambaiyya Bhojpuri' - it *is* a Bhojpuri of sorts? A corrupted version, perhaps? So that audiences everywhere would understand it, you think? It is not Hindustani as was used generally; it is a definite patois. I'm curious now. You are welcome, Raj. I'm surprised that none of the TV channels remembered to commemorate Mohammed Rafi's death anniversary. Thank you for the appreciation. I have linked the songs you listed; of them, Kabhi na kabhi, Koi sone ke dilwala and Main yeh sochkar are particular favourites. I've added links to your list of songs. Haqeeqat had such lovely songs! Thank you for this link. This needs further refinement. If Tulsidas's Ramcharitmanas is taken as classical Avadhi, Ganga Jamuna is slightly different. Actually it is a dialect of the rural UP near Allahabad/Pratapgarh/Lucknow etc., which lies between the Avadh and Bhojpur belt. Bhojpur belt is districts of Western Bihar and adjoining districts of Eastern UP. I don't know if it has any particular name. Therefore, many commentators simply mention it as UP dialect. But if you have to give it a name, it is probably closer to Avadhi. That's very interesting, AK. Thanks for the reply. I was going to ask if the dialect was Avadhi or Maithili. But I remembered that a long time a go, a friend of mine who was raised in Sahranpur, UP, told me that dialects varied so much that when a person from one part of UP went to another, he wouldn't be understood. So, keeping in mind your remark about the dialet, it is interesting why every bit of writing about either the film or the music, talks about the dialect being Bhojpuri. I mean, someone would surely have pointed out before that it is not, in fact, Bhojpuri? I suppose reiteration tends to make people believe something is true. Mind if I ask what about Pipra ke patwa? What dialect would that be? I began reading this post yesterday, Anu, then got pulled into a minor emergency at home - so finished reading it today. What a fine collection of songs! And, how brave you are. Seriously, I would not be able to list my favourite Mohammad Rafi songs - there are just far, far too many. The closest I've come to doing a Rafi post is a 'Rafi in Ten Moods' - in which Mann re tu kaahe na dheer dharefeatured. :-) So we agree on that. Vaise, I actually agree with a lot of the other songs in your list, especially in the latter half of the post. Deewaana mujhsa nahin, Ek haseen shaam ko, Chhoo lene do naazuk honthon ko, Roshan tumhi se duniya... all gorgeous songs. If I were to even begin listing some of my favourite Rafi songs, I'd certainly put Hum aur tum aur yeh samaa on it, but the rest would probably be quite different from your list. Hum bekhudi mein tumko pukaare chale gaye, Dekhi zamaane ki yaari, Yeh mahalon yeh takhton yeh taajon ki duniya, Pukaarta chala hoon main, Mann tadpat hari darshan ko aaj and a recitation from Pyaasa - Tang aa chuke hain kashmakash-e-zindagi se hum - would definitely be there. My goodness, that man's voice can give me gooseflesh. Seriously, I would not be able to list my favourite Mohammad Rafi songs. Yes, he does, doesn't he? Somehow, as Banno put it so succinctly below, I go all around and then come right back to Rafi in the end. And yes, it is nice when your idol doesn't have feet of clay. From all accounts, he seems to have been a wonderful human being. p.s. I hope minor emergency was taken care of, and all is well? Since AK mentioned Chitragupt I rather like this song especially the rhythm shifting from the tabla to the double bass. And this one by N Dutta.. There are two versions of this. The duet is faster and since the film track audio is better than the solo I will post it here. I hope the clothes-line romance will not disappear under inexorable march of the dryer. We must resist such fripperies in the land of the sun and low electricity. Pipra ke patwa - Bhojpuri it is not. The distinguishing aspect is the verb and its forms, and a very unique intonation, which is impossible for an outsider to copy. Aayo re is not used in Bhojpuri; it would be Aail baa, and so on. You may call it a dialect of Eastern UP. For real flavour of Bhojpuri, here is a song by Baleshawar Yadav, a craze in rural Bhojpuri belt once. As you can see the old man has lost none of his naughtiness. (The song means, If you (the maiden) are causing so much havoc in maika, what will happen when you go to sasuraal). This should not create an impression that Bhojpuri is about raunchy songs. There is a good body of nirgun, devotional and deeply philosophical songs. A big part of the Bhojpuri culture is the women's songs of weddings, and other ceremonies. I am surprised, too, why no one corrected the erroneous impression. Nazir Hussain, Ramayan Tiwari and Chitragupta were from Bhojpuri heartland. You have Ravi Kishan, Manoj Tiwari, Manoj Bajpayi in the current generation. I must add, Bhojpuri landscape is changing fast, as is rural India in general. A Hindi poet famously said, Gaaon ab gaaon nahi rahe. While the 60's classics I mentioned were Bhojpuri films in spirit, today's Bhojpuri films are essentially Bollywood made in Bhojpuri (the explanation is Bhojpuri population has become aspirational!). As I have already mentioned in my comment on your previous post (Monkey Business) that I did not want to rush through your post, it applies to this post as well. I have read it in parts snatching some moments from my daily schedule. I wanted to also go through each and every comment as well, your readers are quite a knowledgeable lot, but I just could not make time for that. I enjoyed your post as usual it is very informative. Your song selection is excellent. Rafi is my favourite singer, the other male singer is Kishore Kumar. Being a die-hard fan, long ago that is before I became a full-time journalist, I decided to approach Screen with a tribute to Rafi on his death anniversary. As I began writing the article I realised how great (not that I did not know it already) this singer is. I unfortunately do not have the technical knowledge (that you and your readers have), I am not a singer, but all the same in my words I would like to point out one thing, you see what I like most about him is that he could sing those soft numbers, so wonderfully, almost as if he were caressing and in the same song, he would go on to hit the high notes without yelling. Nowadays singers tend to yell, they have a tendency to go off-key, so in order to control that they try various tricks by unnecessarily modulating their voice in different ways. Take Rafi's songdeewana mastana hua dil it is one of my favourites he starts softly and goes on to a higher note without yelling. Being musically illiterate, I do not know whether I have been able to explain properly what I am trying to say. His versatility was amazing, while he could sing soft numbers like jaag dile diwana with equal ease he would go boisterous with jungle mein more naacha. Those days Shammi Kapoor would attend every song recording (I have heard this) and tell Rafi how he would be acting and dancing, so that Rafi could sing accordingly. I am planning to put this in my blog but all the same I would like to share some of my own memories of Rafi. In my childhood, I loved his voice so much, that I always asked my father,"Is he a very hansome man?" Later we moved into his neighbourhood, he lived in a bungalow quite close to where my father had purchased a flat. We saw him often driving past, actually not driving, his chauffeur drove while he sat beside him (not behind as is the usual practice). I was initially dissapointed by what I saw, but only briefly, for I noticed this gentleman always had a smile on his face, he had a very, very pleasant demeanour. But this pleasant man created some problems for my father, my father was always frustrated, you know why? (did I share this earlier?). The gentleman that he was he never gave my father a chance to greet him first, whenever they drove past each other, he was always the first to raise his hand and greet my father with a broad smile. My father would always tell my mum,"Good Heavens! this man never gives me a chance to greet him first. Aargh. I completely forgot Ek chameli ke mandve tale; I love that song. Thanks for adding it to the links. Dil ki tamanna is a song that I know I have heard before, but I definitely didn't remember it. It also closely resembles a Malayalam song; do you know which one? Shilpi, I know exactly what you mean by caressing the soft notes, and hitting the high notes without yelling. Just listen to Toote hue khwabon ne - that is a perfect example. What a lovely anecdote about your father and Rafisaab; *I* had a smile on my face after reading that. Thanks, Shilpi. Ak, that was very interesting; thank you for that detailed reply. All I know of Bhojpuri films is what you describe as 'Bollywood films made in Bhojpuri', and the raunchy posters. Which is a shame, come to think of it. Like you, I wonder why the people who knew that the dialect was not Bhojpuri did not correct the impression. Thank you for stopping me from perpetuating that impression further. I have frequently tried to compile a list of "the best Rafi songs" or maybe "our favourite Rafi songs" or some such theme, with some friend or sometimes with my sister. And everytime we've given up in despair when the list kept getting longer and longer. So I'm not surprised to see so many varied opinions on this post, more then usual I think. Anyway I'm glad to see that you picked "Hum aur tum aur yeh sama...." first to represent the vast ocean of "Rafi sings for Shammi" songs (of course, later on you have "Deewana mujhsa nahin..). Only thing lacking was a Johnny Walker song, not sure which one, maybe "Jungle main mor naacha.." or "Jaane kahaan mera jigar gaya re.." or "Thel malish,..." or..., or.... Great post and looking forward to Mohammed Rafi II. "p.s. I hope minor emergency was taken care of, and all is well?" Yes, thank you. We had another minor (we thought!) emergency last night, but again all well. Thank you, Nalini. I know exactly what you mean by 'teenagerish appreciation'. Raj, thank you for introducing me to another 'new' old song. I have not watched Vallah Kya Baat Hai and apart from a couple, I don't think I've ever heard any of its songs. I'm just providing a link here for all my readers. Thanks once again. unfolding the versatility of Mohd. Rafi. Lata because, I thought then, she was mean to him. they were few) was also not very far away from the worst too. I have come to the conclusion that he was like a play dough and it was up to his MD’s to mould him, I think SDB was best at it. time but for Lata and Rafi I can go on for ages and never get enough. wake to that song every single day of my life. I will add 2 songs that come to my mind now. Ashraf, no, you are not boring at all. This is a place where we all share our experiences, and it is nice to see how people from disparate cultures, backgrounds, etc.are bound together by a common shared love. Hui shaam unki is such a lovely song. I'm glad you posted the link here. I had not heard Mile na phool toh before. Thank you for introducing me to this song. "But then, I could make a hundred disparate lists of Mohammed Rafi songs..."
"my favorite singer is whoever's song is enchanting me at the moment mindset,"
I absolutely love Mujhe dekhkar aap ka muskurana ; it is one of my perennial favourites. So is Aise toh na dekho... thanks for the links. "A surfeit of Rafi...", well, that sounds rather improbable, maybe like a surfeit of ice cream, which lasts until the next flavour comes along. Okay, you did it with this post, Anu! I read through the post, the songs were so tempting that I clicked on the Playlist and ... listened to all of them! What a treat! The only unfamiliar one was the song from Mirza Ghalib and even though I have listened to it twice, it fails to ring a bell. It goes to show that there were a few songs in those days that even I hadn't heard! I wish my father was still here, so I could use this to refute his allegation that I was eternally glued to the radio in those days and knew every song but didn't know my schoolwork! Tu kahan yeh bata ..., Toote hue khwabon ne ..., Jaane kya dhoondhthi rehti hain ..., and Aap ke haseen rukh pe ... are eternal favorites and so are a million others, including Likhe jo khat tujhe ..., which is from a later period, lacks the soft touch, but still appeals to me. After Aradhana was released, I jumped on the Kishore bandwagon along with a million other college girls like me, all dewy eyed over Rajesh Khanna and his movies and songs, which naturally meant Kishore Kumar. However, it took me a few more years, actually, more like 15 or so, to go back to appreciating Rafi and his songs, especially the old ones. I had already left India when Hum Kisise Kum Nahin was released, so I never knew those songs until a few years back, when I started listening to songs from the period between my departure from India and the 90s, when nothing sounded musical. And I am glad I did, because that made me appreciate the old timers, especially Rafi, even more! Thanks, Anu, for a wonderful experience! Lalitha, so good to see you here! And I'm very glad to note that you listened to all the songs on the playlist. :) Researching songs for this post, especially the not-so-well-known ones, gave me a earful. Such a vast treasury waiting to be explored, even for people like us, who grew up with our ears glued to the radio! With the plethora of music uploaded to cyberspace, the lesser known songs are also getting their place in the sun. excellent job in selecting sixteen solos that Md.Rafi had rendered for sixteen different composers. Md. Rafi does complete justice to the diverse styles of those music directors. Thank you Anu Ji for the excellent post and selection of songs. I will not try to pick up my favourites from these sixteen. Each and every one of them is a gem. I am sorry. I am horribly late. I took my time to read and listen to the songs, some of them entailed repeated listening. Although none of the songs were new to me, I am hearing some of them after a long time. It was pleasure listening to them again. Majority of the songs, that you have presented are, as expected, from the 60s (10 out of 16). That was the period I got to hear Md.Rafi’s songs for the first time. If I remember right my first exposure to Hindi films songs was through Junglee and then Dil ek Mandir. Shankar-Jaikishan was the MD for both the films. Ehsaan tera hoga mujh par, Yahoo Chahe koyi mujhe junglee kahen, Aai Aai Ya Sukoo Sukoo were the earliest Md.Rafi songs I got to and loved to hear. Yaad Na Jaye Beete Dinon Ki is another song which I cherish to this day. I believe, Md. Rafi sang most number of songs for Laxmikant- Pyarelal, Shankar-Jaikishen and Naushad, in that order. I think the maximum number of solos Rafi had rendered for must be either Madanmohan or Naushad. If I had to make list of 10 songs that come instantly to my mind all of them will be from the 60s. Many more gems of Md. Rafi have come up in the comments section. Let me present this solo from Dil ek Mandir. This was one of the earliest Rafi solos that I loved to hear. Yaad Na Jaaye Mohd Rafi, Dil Ek Mandir (1963), lyrics Shailendra, music Shanker Jaikishan. Md.Rafi’s solo with Jaidev was not in your list. Let me present one of the solos. Out of the dozen odd solos that Md.Rafi sang for CR, 4 were for Jhonny Walker and one was for Agha. Here is the song he sang for Agha. BTW his first song for CR must be song Kehke bhi na aaye tum, which did well, from the film Safar (1946). As far as I know Md.Rafi never composed music for films. But he did compose a few NFS songs. Here is one of them. Thank you very much once again for this wonderful post. Listened to the songs posted from the comments section. The number songs ( 54 till now) posted in the comments section proves the point that the list Rafi’s best solo songs (leave aside duets) is endless..
BTW Anu Ji the link to the song Chhoo Lene Do Nazuk Honthon Ko is blocked. You may replace it with a fresh link. Thank you so much, Mr Venkatraman, for the kind words and the detailed comment. I agree with you that making a list of Mohammed Rafi songs is not difficult. It is when we find that we cannot stop at one list that the problem ensues. Out of the songs that you have posted, I absolutely love Yaad na aaye and Kabhi khud pe. And I didn't know that he composed as well. Thank you for that tidbit. best solo songs (leave aside duets) is endless.. Isn't it? I'm so thankful they are; and they are songs that one can listen to, again and again. Thank you also for spotting the broken link; I have fixed it. I had no idea that Zafar's last ghazals may not have been written by him! I've always heard of Lagta nahin dil mera and Na kisi ki aankh ka noor hoon as his! Any idea who wrote them? Wikipedia does say that one of the verses in the former ghazal is not his, but does not dispute the rest. You must admit that an exiled emperor penning all these lines is quite tragi-romantic! I loved all the songs you listed, and second your liking for his poetry renditions - there are some lovely ones from Pyaasa as well. Great Anu - wonderful post. I really enjoy the song Piya Piya from Baap Re Baap, especially due to Kishore's ability to turn a situation around. But here is another Ghoda Ghadi that does not seem to have been on your list from Anand Ashram, perhaps because it was not a very famous movie and the more famous song was Saara Pyaar Tumhara. Raahi Naye Naye from Anand Ashram. You seem to be going through my blog at rapid speed, Ranji. You do my heart a lot of good. :) Just knowing that older posts continue to be read and enjoyed makes not just my day, but my week and month! I have seen Anand Ashram and yes, I've heard this song, but as I mentioned in my previous comment (on the Johnny Walker post), my lists usually include my favourites. (Those also include less-known songs, not just the famous ones, or the popular ones, actually.) The comments section is open to all songs, though, so I'm glad you added it. I like Ghoda-gaadi songs and OP Nayyar made use of that sound extensively in his songs. Not surprisingly 5 of his songs made it to your list. 'Koi tangewali' from Sholay also fits the theme and I would probably have it instead of the AAA song. Looks very similar to the Tumsa Nahi Dekha song , including Shammi K's looks. Was this there in your shortlist ? Ek toh soorat pyaari was on my list, but I inexplicably forgot about including it in the post. However, Dustedoff added it to the comments below. It's a decent enough song, not one of Shammi's best - because he had so many songs that were way better - but definitely very hummable.
" Koi pyaar ki dekhe jaadugari" in Kohinoor.Must watch it,and watch it carefully.Both Dilipsaab and late shree Meenaji seem to ride on separate horses.So not exactly a ghodagadi song.But both seem so well synchronized that one gets an illusion of ghodagaadi.A GORGEOUS SONG.Must watch. Thank you for reading, and commenting.